Crickets chirp loudly and a tractor rumbles down a dirt road cutting through the fields of a 120-acre, century-old farm in Manistee County. 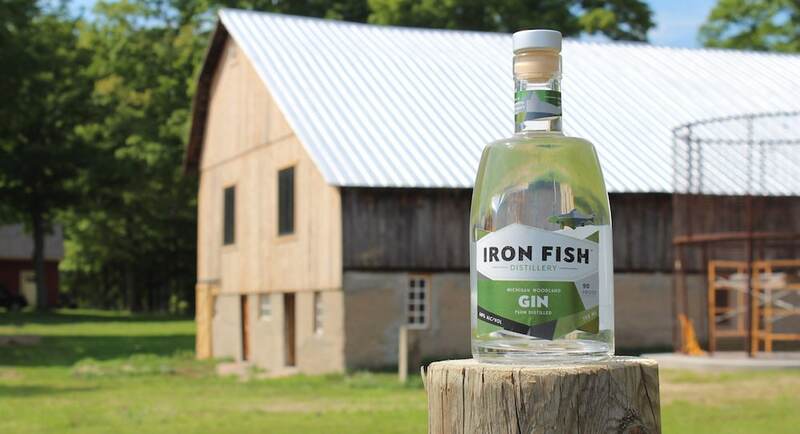 Once serving as the granary for the community, the property is now home to Iron Fish Distillery, Michigan’s first working farm dedicated to distilling small-batch, craft spirits. Co-owners and sisters Sarah Anderson and Heidi Bolger have a history in Northern Michigan. Their mother grew up in Benzonia before moving downstate, and as children, they spent time visiting their aunt in Beulah during the summer. “We’ve always loved the area,” Sarah says. “The river, Lake Michigan; they’ve always been a part of our family.” In 2011, Heidi her husband David Wallace had an opportunity to buy the farm, which had been abandoned for 20 years. They didn’t know what they wanted to do with the property yet, but they knew they wanted to be Up North. In September 2015, they broke ground on Iron Fish Distillery partnering with Sarah and her husband Richard. One year later, they are opening the doors to the community on Labor Day weekend. 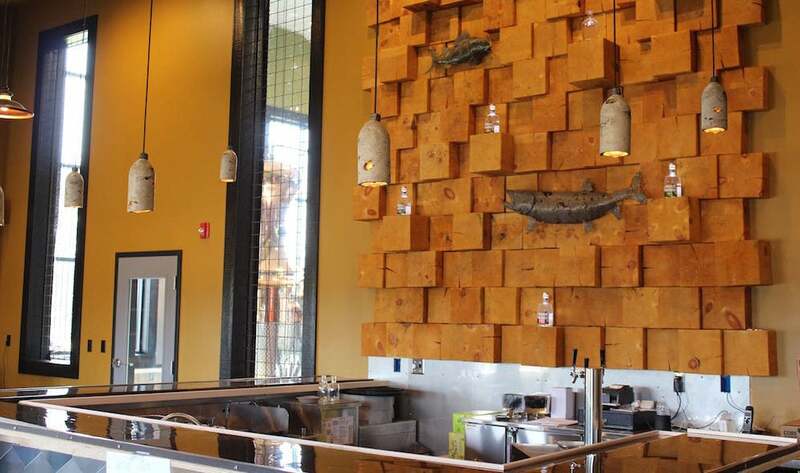 A three-day Grand Opening Party is being held Friday and Saturday from noon to 10 p.m. and Sunday from noon to 7 p.m.
Iron Fish is located seven minutes from Crystal Mountain Resort and 25 minutes from Arcadia Bluffs. “I like to say we’re in the middle of nowhere, but we have great neighbors,” Sarah says. St. Ambrose Cellars in Beulah and Frankfort’s Stormcloud Brewing are also nearby. Read this Traverse Magazine feature about Iron Fish! The full cocktail bar is stocked with locally sourced, fresh ingredients for the seasonally-based menu. Cocktails like the apricot and rosemary mojito being served this weekend will rotate through the list. 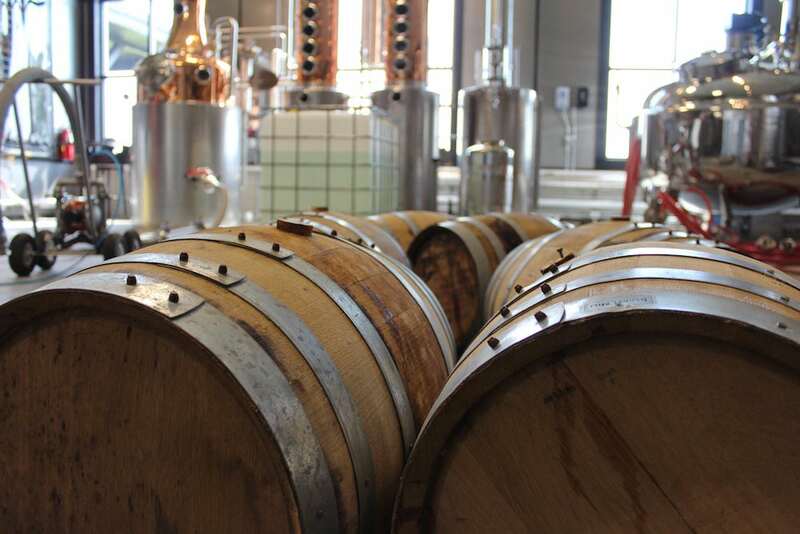 Vodka and rum are currently available at the distillery, and white whiskey and gin are in the works. The dog- and family-friendly distillery is also offering a kids menu with drinks and snacks. Four food trucks will rotate in the parking lot throughout the year offering tacos, barbecue and Asian food. There will be live music a few nights a week and events including a Kentucky Derby party. Outside, picnic tables and Adirondack chairs beckon visitors to the front lawn where lawn games like giant Jenga are available for kids and adults. 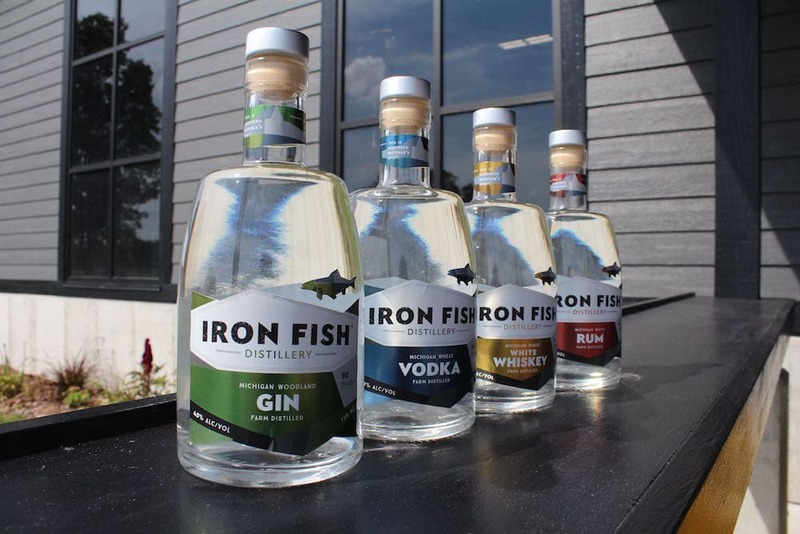 Iron Fish Distillery is environmentally verified by the Michigan Agriculture Environmental Assurance Program, a voluntary program that helps farms of all sizes prevent or minimize agricultural pollution risks. “The Betsie River is right behind the treeline. It’s important to us to farm in a way that protects the watershed and doesn’t deplete the land,” Sarah says. The distillery is also committed to partnering with Michigan farmers who follow practices to protect the health of watersheds to source the remaining grain needed for their products. Event space rental: A beautifully renovated barn built in the late 1890s sits next to the distillery. The first wedding is being held there in October. Private tasting room: Located above the distillery, the room can be used for events like rehearsal dinners, meetings or family gatherings. Distillery tours: Begining September 8, visitors can take a tour of the farm production process, distillery and barrel room. Tours end with a tasting. Farmhouse rental: In 2017, the red farmhouse next door will also be available to rent. “We want to bring the community in and let people use our facility for their ideas,” Sarah says. The idea for Iron Fish Distillery came from a 2013 trip to Scotland where Richard and David were celebrating Richard’s birthday. They went on tours of distilleries including a farm distillery on the Island of Islay. Inspired by the trip, the pair came back home with an idea for the old farm they’d purchased in 2011. “They didn’t say anything about the idea when they came back,” Sarah says. “Then all of a sudden, my brother-in-law put a deposit down on a still. Iron Fish Distillery is located at 14234 Dzuibanek Road in Thompsonville. For more information, call 231.378.3474.